PCLD utilized CameraMatch, a Vectorworks plug-in, to align the 3D model with site photographs and create renderings that were more realistic and easily recognizable by stakeholders and users in context with the existing site and its surroundings. 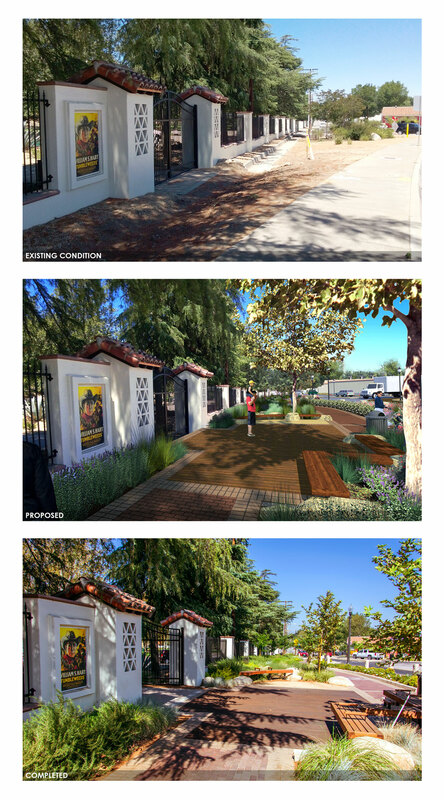 When the City Council of Newhall, California asked Pacific Coast Land Design (PCLD) to bring new life to their economically flagging Main Street, the firm looked to the area’s past to provide it with a brighter future. The city’s storied history as a Native American trading center, an outpost of the Wild West, and then a backdrop for the western films of the early 20th century gave PCLD plenty of material to construct an engaging, pedestrian-friendly experience that they’ve termed Old Town Newhall. “The area’s rural, equestrian character and distinctive past are important community values that were almost lost,” says PCLD Principal Chris Roberts. “We wanted to strengthen the community’s heritage and instill a new sense of pride in downtown Newhall.” To accomplish this, the firm incorporated elements from the surrounding landscape into their Wild West-themed design, placing bollards emulating hewn local stone from a nearby creek alongside wooden lodge pole horse ties to give the area a uniquely “Newhall” aesthetic. To learn more about how PCLD transformed Newhall into the thriving community center that it is today, read their success story.